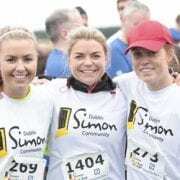 Niall Murtagh from Dublin Simon Community’s Health and Wellbeing programme has some advice for walkers, joggers and runners of all abilities ahead of the first Simon Home Run this Saturday in the Phoenix Park. Running events don’t come any better than this one! 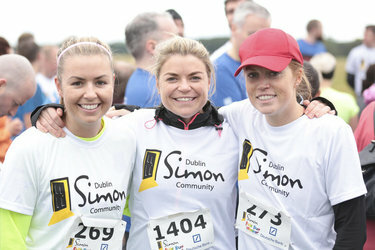 The Dublin Simon Community 5mile (8k) run/jog is long enough to test your fitness without being too strenuous, even if you are a beginner. Anyone can do it. If you are new to running, don’t fret, the Simon Home Run is a great place to start. I promise those who compete will feel a great sense of achievement in completing the run and by the end of October 7th you may even find yourself signing up for the next one. I have put together a few tips to help improve your running skills on the day. – All beginners taking part in the Simon Home Run should approach the race as more of a brisk walk with a few short jogging intervals. Try walking for the first 30 minutes then every five minutes go for a slow jog. During your recovery walks take your time and have fun, enjoy the scenery of Phoenix Park, talk to family and friends taking part with you and encourage others as they run by. It could be you next year running in need of some gentle encouragement. – While jogging it is important to be as efficient as possible. Think about how your foot is contacting the ground, aim for the mid section. Maintain an upright posture while landing with your feet under your hip and propel your body forwards, this allows your body to naturally absorb impact and save energy. – While jogging, your arms should be swinging to help you move forward. Keep the movement from the shoulders with your elbows bent at 90 degrees and hands relaxed. This will also save energy. Don’t worry about this too much at the start – it will come to you. – When it comes to breathing there are no specific rules for beginners. The aim is to be in control of your breathing – if you find yourself struggling just slow down and recover. – And finally do not be tempted to over train in the final days before the event. A last minute run tonight risks injury. A gentle walk or swim is okay but avoid anything too strenuous. Preparation is key to ensure nerves are settled before the event. Remember to give yourself plenty of time to get ready, have a good breakfast and double-check that you have everything you need with you before leaving in plenty of time. During the race don’t be afraid to harness the support of the crowd, sometimes a timely cheer from a follow racer can have the same effect as being able to see the finish line and give you the adrenaline needed to carry on. Remember to have fun; it’s all for a good cause! You can still register for the event on the day itself, so we hope to see you all there.